ADAMSVILLE - Betty Rials was looking for a way to remind her church members at Adamsville Baptist Church to pray for state missions during the WMU of Texas Mary Hill Davis emphasis week. She looked out in her front yard and found the answer - bricks! Betty became a brick collector about 25 years ago, and knew the value of the bricks made in Ferris, Texas, between 1902 and 1903. 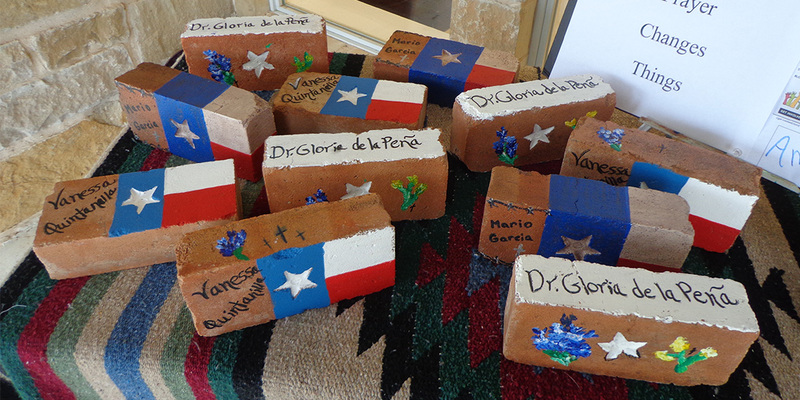 She gathered together 12 bricks and began painting the names of River Ministry Coordinators Mario Garcia, Dr. Gloria de la Pena, and Vanessa Quintanilla on them. After an especially difficult summer along the border, Betty knew the River Ministry Coordinators could use prayers for strength, endurance and joy. “There isn't anything magical about these bricks, but the age of them, the scarcity of them makes them unique, and we are praying big, heavy prayers for these missionaries," Betty shared. This past Sunday, she sat outside the sanctuary before and after their morning worship service and handed the bricks out to her friends. “I wanted to put something in a person's hand and say, 'Will you pray for this person?,'" she said. “We are a small, rural church. Members travel as far as 25 miles away to come to this country church. I began to think - how can we get this point across to these people that prayer is necessary? That money is necessary to encourage missions across the state?" A heart for missions and a personal handmade reminder helped share the message and importance of prayer in this small town. Are there ways you can reach out in your congregation to do the same?